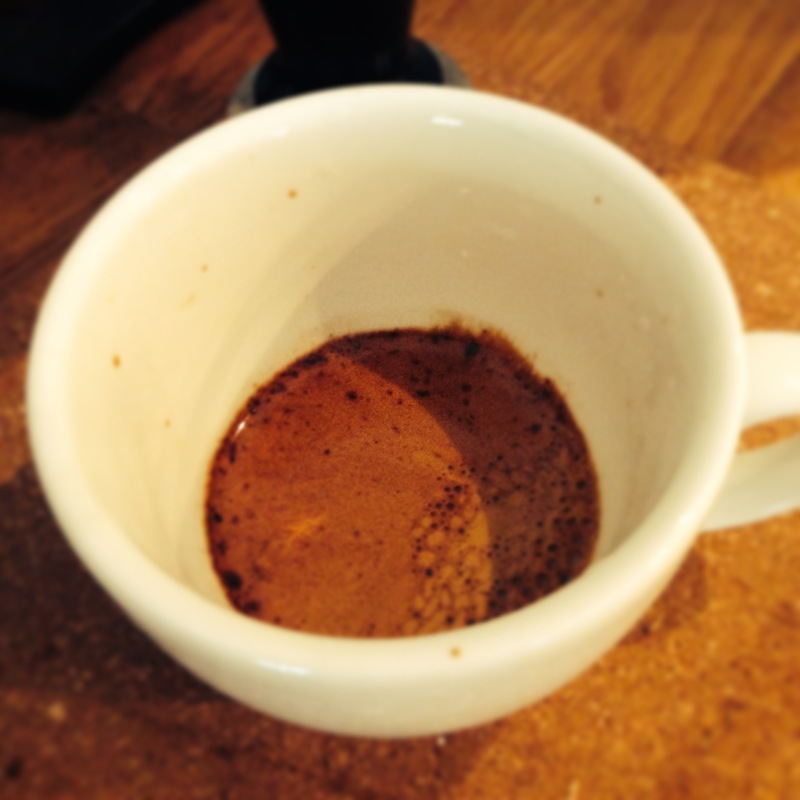 A good picture of an espresso ? Well, almost but sometimes it’s not about looks, sorry guys and gals who spend time perfecting their looks and espresso shots, BUT ultimately it’s about taste. I’m passionate about the “real” deal. So many times I taste stuff, especially cakes, that look fabulous, but when you bite into it, you’re like screaming, Why!!!!!!!! I prefer something to taste better than it looks, but of course the ultimate culinary experience is for something to look and taste great simultaneously. So, how about what you don’t see where were we… what do you see…. BUT! Let’s build on that last point. First up the facts. 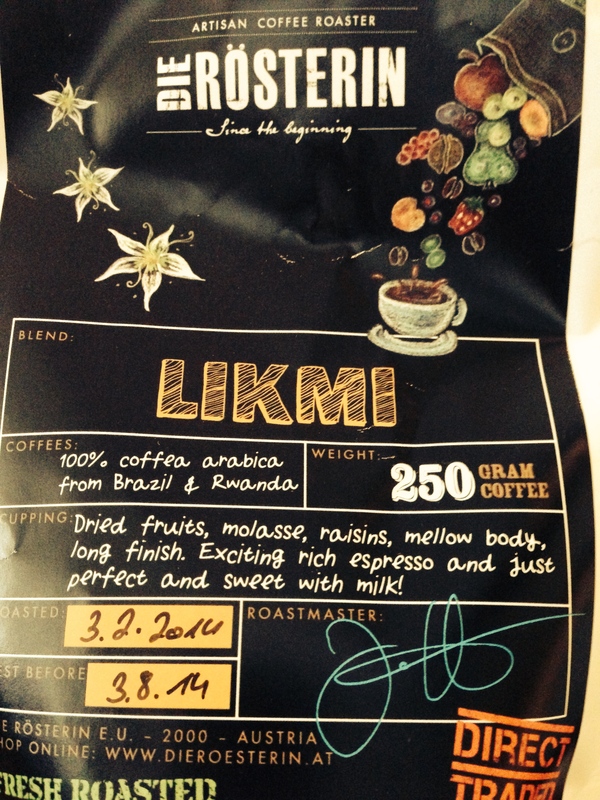 It’s an espresso blend, called LIKMI (lick me), roasted by Jo Wechlesberger, of Vienna School of Coffee Master Roaster extraordinaire, to get an espresso roast so delicious and sweet, that you just want to….. yep. you guessed it, “lick it”. In it, are coffees from Brazil and Rwanda with a roast profile of dried fruits, molasses – see the bag below. Secondly, we know that it’s just not about the beans and roast profile – if it was, anyone could learn how to roast coffee like a pro, and we know that’s not true, if not, I’ll be on the waiting list to do so pronto. It’s takes guts, experience and something you can’t buy, a gift or skill – God given and some may argue on that point. But, that’s not all. When I went in to buy this special coffee, Jo told me that she had started using burlap bags to pack her coffee and had noticed that it seemed to preserve the coffee taste for longer and of course it is also better for the environment. So, upon buying the coffee, I raised concern saying”it was roasted about a month ago, are you sure its fresh enough for espresso?” Of course, she said. So, when I got home, and pulled my first shot, I was pleasantly surprised, but more so, after another few days of pulling shots, I realised that the coffee still tasted great, sweet and caramel like. I DRANK THIS COFFEE IN MARCH 2014. 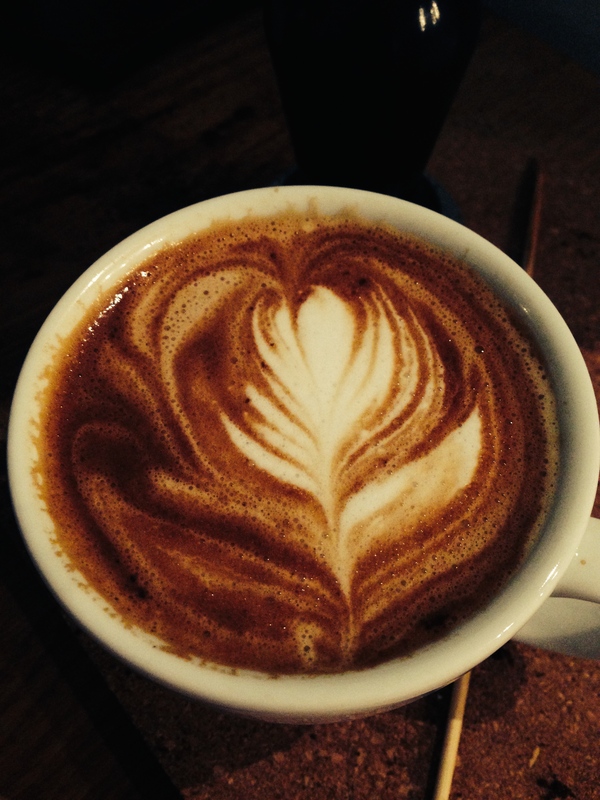 With milk (excuse my latte art), it was really sweet – caramel and raisin sweet, yummy. The picture at the top is an espresso shot following all the rules but using coffee that was roasted over a month ago and still with a great taste (I usually don’t use espresso blends over 2 weeks old) – it’s the first time on this blog that I’ve shown a picture of an espresso shot using coffee roasted over a month ago. So, once you’ve mastered the skill of roasting, taking care of your beans by packing them in environmental friendly packaging could preserve the taste and your reputation far and beyond, especially if you are in the online coffee selling business. It also helps if you have a roast profile that’s sweet like dried fruits, which tend to develop into complex tastes profiles, giving you the joy that different cups will give you different tastes.